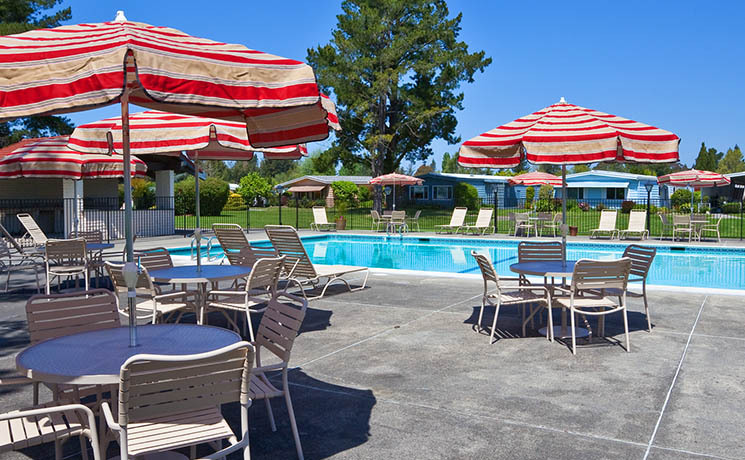 Rancho Grande is an age-qualified and gated manufactured home community located in the heart of Sonoma County. The property offers 40 acres of pristinely manicured gardens in California’s wine country. With 309 residential manufactured home sites, Rancho Grande has created a social community which prides itself on community involvement in a resort-like setting. Residents of the Park enjoy a spacious clubhouse with a grand ballroom, a living room area (boasting a flat screen television and library), a community kitchen, a spacious card room, a billiards room, and a beautiful pool and spa in a landscaped setting. Rancho Grande is situated in close proximity to many cultural venues and exciting destinations. The property is located among notable Sonoma wineries, within twenty minutes of the renowned Napa Valley, and one hour from San Francisco. Rancho Grande provides its residents with an active atmosphere in the heart of the Sonoma wine country and a convenient proximity to nearby wineries and culinary gems. Minutes away from exceptional wineries and restaurants located throughout the Sonoma and Napa Valleys. For information regarding residency and home sales at Desert Sands Manufactured Home Community please contact the on-site managers. Private community showings by appointment only. Rancho Grande Manufactured Home Community is owned and managed by the Rancho Grande Manufactured Home Community, LP.